“My teacher, let me see again.” It’s the obvious answer to Jesus’ question. What else would a blind man ask for? It may be the obvious answer but it is not always the answer given. No one wants to be blind. That’s not the question. The deeper question is whether we really want to see. Do we really want to see the reality of our lives, things done and left undone, who we are and who we are not? Do we really want to see the needs of our neighbor, the poor, or the marginalized? Do we really want to see the injustices of the world? Do we really want to see who Jesus is and not just who we wish or want him to be? “Do you really want to see?” That’s the question Bartimaeus must answer. True seeing is more than simply observing with our physical eyes. It implies relationship and a deeper knowing and understanding. This happens when we see with the eyes of faith. This seeing, however, is not without risk. If we really want to see then we must be willing to change and be changed. We must be willing to leave behind what is to receive what might be. Sometimes that risk is too much. We turn a blind eye and choose not to see. This is not about physical blindness. It is a spiritual condition. Peter rightly declared Jesus to be the Christ but when Jesus began to teach about his own suffering, rejection, and death Peter rebuked Jesus. Peter could not see how that could be the way of the Messiah, God’s anointed one (Mk. 8:27-33). The disciples argued among themselves about who was the greatest. They were unable to see that “whoever wants to be first must be last of all and servant of all” (Mk. 9:35). The rich man wanted to inherit eternal life but he just could not see his way clear to selling all his possessions and giving the money to the poor (Mk. 10:17-22). For most of us life is neither all seeing nor all blindness. There are times when we get it and times when we do not. That’s how it was for Bartimaeus too. It wasn’t always darkness. Remember, Bartimaeus asks to “see again.” At the end of the story we are told that he “regained his sight.” There was a time when Bartimaeus saw. There was a time when he and the world were filled with light. Bartimaeus has known darkness and he has known light. He has had vision and he has been blind. Both are a reality for Bartimaeus and for us. Jesus offers a clear vision of what true life looks like. To the extent we do not share that vision we are blind. We live in darkness. As tragic as blindness is, the greater tragedy is when we do not even see that we are blind. We bump and stumble our way through life believing that this is as good as it gets. We are content to sit by the roadside and beg. How and what we see determine the world we live in and the life we live. Bartimaeus knows this. He is a blind beggar. He is going nowhere. The world passes by but his life remains unchanged. Every day is the same. He sits by the roadside, holds out the cloak of his blindness, and begs. He lives in darkness. There is no illumination within him or around him. The darkness covers him like a cloak. At some point or another all of us sit by the roadside, a beggar, cloaked in darkness, unable to see. We are blind. This blindness happens in many different ways. Sometimes it is the darkness of grief, sorrow, and loss. Sin and guilt blind us to what our life could be. Other times we live in the darkness of fear, anger, or resentment. Doubt and despair can distort and impair our vision. Failures, disappointments, and shattered dreams can darken our world. There are times when we hide amongst the shadows neither wanting to see nor to be seen. Perhaps the deepest darkness is when we become lost to ourselves, not knowing who we are or the beauty of our creation and existence. The list could go on and on. The darkness fills and covers us in a thousand different ways. I do not know what caused Bartimaeus’ blindness. In some ways it does not matter. What matters more is that he knew he was blind. He held his blindness before Christ believing and hoping that there was more to who he was and what his life could be. It was out of that knowing, believing, and hoping that he cried out, “Jesus, Son of David, have mercy on me.” That is the cry of one who abandons himself or herself to God. The one who cannot see cries out to be seen. It is the cry that stopped Jesus in his tracks. Mercy is like that. “Call him here,” Jesus said. With that calling the depths of human darkness meet the heights of divine light, misery meets compassion, and what is meets what might be. Bartimaeus stands before Jesus. Jesus asks him, “What do you want me to do for you?” That is not just a question for Bartimaeus. It is a question for every one who has ever sat by the roadside of life, every one who has ever lived in darkness, every one who has ever begged for life. It is a question for you and for me. It is a question Jesus asks of us over and over, again and again. There is no universal answer. There is only our answer at this time and place in our life. Tomorrow’s answer may be different from today’s. Jesus’ question offers a turning point, a new beginning. It asks us to look deep within our self, to face what is, and name what we want. So what do you want Jesus to do for you? I am not asking what would make you feel better, fix a particular problem, or make your life more comfortable. What is the one thing you need today that will open your eyes to see yourself, others, and all of creation as beautiful and holy? What is the one thing you need today that will allow you to throw off the cloak of darkness? What is the one thing you need today that will take you from sitting and begging by the roadside to following on the way? They are hard but important questions. They are the questions that will change your life. I do not know what your answer is. I cannot name it for you but I can promise you this. He is listening, he is willing, and he is able. This sermon is based on Mark 10:46-52. The collect and readings for the day, the Twenty-second Sunday after Pentecost, Proper 25B, may be found here. Your comment and quotation from St. Teresa started me thinking more about darkness. That led to St. John of the Cross. Darkness has both a negative and a positive aspect. As you point out the darkness can be about sin and the negative deeds we commit. For St. John “the dark night” is the creative environment of transformation. Thank you for your insightful comment. Leela, thank you for your kind and encouraging words. I would like to be able to post earlier but usually do not finish my preparation until sometime Saturday. Often my post is a combination of what I planned to preach, what I actually preached, and what I wish I had preached! Father Mike, you’re an anchor. Thank you. I wish I always knew that dying into Him is joyful. Especially during those times when I decide that *this* is what I need to do, and, surely it’s what I really wanted anyway. Would you say a short prayer for me, that I might grow in hope? 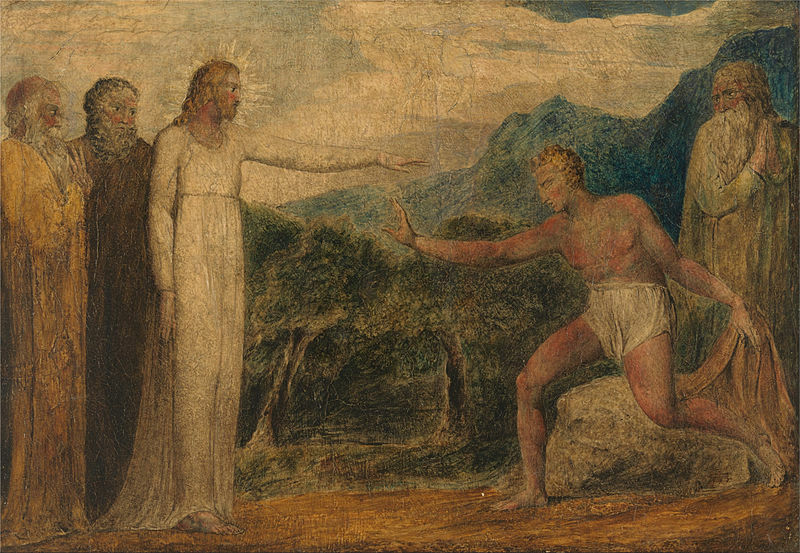 I like Blake’s hands – the guy on the right praying *away* from Jesus, Bart laying down his clothes, Bart reaching to touch, Jesus already there, doing more for him than he can imagine. Michael, dying is really hard work and, as your prayer request suggests, grounded in hope. I will remember you in my prayers. There is much to see in Blake’s drawing. One of the things that struck me was Bartimaeus’ eyes. Previous Previous post: The Seat of Arrogance or the Heart’s Desire?